Why not make the most of your furniture investment by plumping for one of the Country collection’s charming and stylish 5 foot Low foot end beds? The bed combines reliability and practicality with the stylish classic country look and has been hand crafted using traditional techniques. 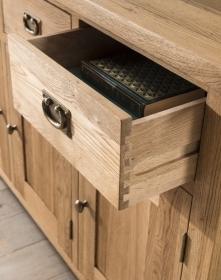 A brushed oil finish has been given to the strong, pure American White Oak used in the build. The end result pleases the eye whilst ensuring you get a good night’s sleep.